There's no program quite like Dabo Swinney's Clemson. 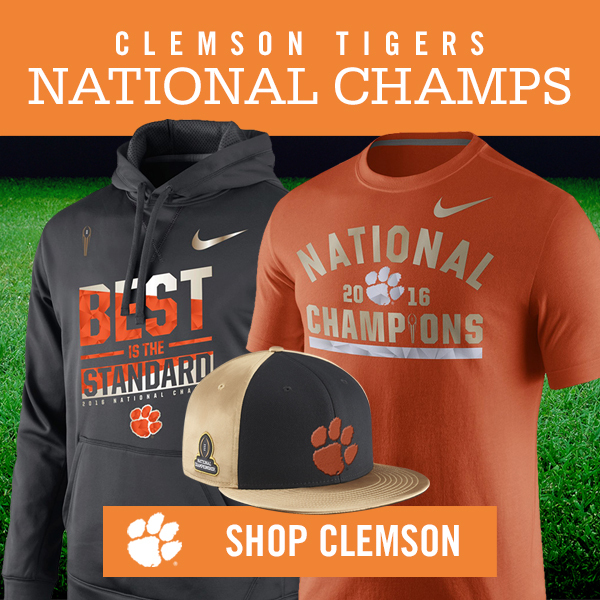 After years of building around a unique philosophy, the Tigers finally won the national championship. This story appears in the January 16, 2017, issue of Sports Illustrated. To subscribe, click here. After putting Clemson in position to win the championship that had eluded the school since 1981, Deshaun Watson sat on a black folding chair near the Tigers’ bench and watched the victory come apart. The junior quarterback and two-time Heisman Trophy finalist stared at a big screen and gnawed his mouthpiece as Alabama, the unbeaten and unyielding goliath, began stampeding downfield. Moments earlier, with 4:38 left in the fourth quarter, Watson had driven the Tigers to their first lead of a national title game, in which they’d mostly been smothered. He muttered as the Crimson Tide converted a fourth down. His knees bounced as Alabama moved into scoring range. When the touchdown came and it appeared that the same team would vaporize his title aspirations for a second straight year, Watson stood up, stone-faced, and checked the Raymond James Stadium clock. There were two minutes and seven seconds left. Watson smiled. In last year’s Clemson-Alabama epic, a 45–40 Tide win, he felt he simply ran out of time. Now Alabama had given him a little too much. “Let’s be legendary,” Watson told his teammates in the huddle, before producing a moment that defied a better description. When Watson tossed a two-yard touchdown pass to Hunter Renfrow with one second left, when the quarterback spread his arms wide and raced to midfield after sealing Clemson’s 35–31 victory and the second national title in program history, he had completed both a January classic and a mission eight years in the making. Fun finally won. It wore down a stomping giant on a cool night in Florida, quarter by quarter, drive by drive, play by play. And afterward, it sang and gyrated for the world to see. Two days earlier Clemson coach Dabo Swinney had been asked what such a breakthrough would mean. He talked about giving people hope and proving that greatness is for everybody. As Swinney wrapped up his winding response, he cited a question asked around his football offices in the years since he took over in 2008. The query evoked—perhaps coincidentally, perhaps not—the pachyderm mascot of a certain program that for years had dominated the college football landscape and once again stood in the way of the Tigers’ ascension. How do you eat an elephant? Swinney asked the assembled media day horde. At the intersection of Perimeter Drive and Jervey Meadows, a whiteboard nailed to a pair of tall wood beams reads, Clemson University Football Operations Center. Make a right and follow the mechanical whir of cranes and the beep, beep, beep of construction vehicles in reverse, and it is soon apparent that the sign undersells the facility under construction. “Welcome to Dabo Land,” says Thad Turnipseed, Clemson’s director of recruiting and external affairs, as he walks toward the $50 million work in progress, where scores of hard hats hustle to finish construction by the scheduled Feb. 1 ribbon cutting. The bells and whistles are complemented by more functional highlights such as a massive weight room, injury rehabilitation equipment and an academic center. In whole, the facility can be viewed as a 146,000-square-foot shrine to stability. Clemson became one of the nation’s elite programs because it decisively and aggressively committed resources to pursuing championships; the new football center is one of several investments meant to ensure the fun never ends. “We’ve pushed our university, we’ve pushed our donors, we’ve pushed to say, Look, if you want to have this type of success, we need to have resources,” athletic director Dan Radakovich says, noting that no state money or student fees have been used for any of the projects. Jeff Scott, the Tigers’ co-offensive coordinator and a Clemson receiver from 2000 to ’02, recalls a time when staffers rolled in used pool tables for entertainment, and his peers were plenty excited. “Players were hiding the cue ball in their lockers so they could play the first game after practice,” Scott says. No one has to contemplate hoarding now; even if the two pool tables in the lounge are occupied, there’s a golf simulator a few steps away. And consider how swiftly Clemson worked to refurbish player accommodations at its Lightsey Bridge apartments. In ’13 the program lost out to Auburn on top 25 recruits Montravius Adams and Carl Lawson, both defensive linemen. When explaining their decisions, both players cited quality of housing. The following year Clemson’s offensive staff visited Auburn’s coaches to exchange ideas, and on a lunch break, Scott sneaked across the street to the player apartments and persuaded a resident to let him take pictures of the rooms. He shared the photos with Swinney, Turnipseed and other administrators upon returning to campus. While the money helps Clemson keep up with the Joneses, it’s the fun-loving culture that sets the Tigers apart, and there the 47-year-old Swinney sets the tone. He traces his commitment to joy to Gene Stallings, his coach at Alabama, who instilled in him the need to have fun no matter the score or situation. “I never want guys to dread coming over here,” Swinney says. Meetings start at 8:15 a.m. so staffers can drive their children to school. During the season Wednesday night is Family Night, with coaches, their spouses and kids, and players invited to eat dinner together on the fourth floor of Memorial Stadium. Almost daily Elliott’s wife, Tamika, brings him a Chipotle chicken burrito with brown rice, black beans and a little corn salsa, and he takes a break from game-planning to have lunch with his better half while his sons, A.J., 3, and Ace, 1, run the halls. “Not one person complains,” Elliott says. Then there is defensive coordinator Brent Venables, who won the Broyles Award as the nation’s top assistant this season and who has directed a top 10 unit each of the past three years. Clemson pays Venables a robust $1.4 million a year, but a paycheck isn’t the only reason Venables is in no hurry to leave. “We’re not uncomfortable saying, Hey, fellas, I’m going to watch my son play in a scrimmage, I’ll be back in an hour, you guys hold it down,” Venables says. “Sometimes more is not better. There’s that balance. I respect that, and I don’t take that for granted.” Only one assistant has left the staff since 2012: Chad Morris, who took the head coach gig at SMU in ’14. The comfortable and content staff has had talent to work with too. Clemson has brought in composite top 15 recruiting classes in four of the past five cycles. (Its current class ranks 13th nationally.) Motivated fans and a synchronized athletic department plus happy and talented players and staff are the makings of a great program, but it takes more than a list of ingredients to cook a championship meal. Clemson Tigers quarterback Deshaun Watson holds the CFP National Championship Trophy following his team's 35-31 victory over the Alabama Crimson Tide. Fired up, Clemson Tigers linebacker Ben Boulware shouted: "It's coming home, baby! It's coming home!" during the CFP trophy ceremony. The Clemson Tigers celebrate with the CFP National Championship Trophy following their 35-31 victory over the Alabama Crimson Tide. Clemson Tigers head coach Dabo Swinney kisses the CFP National Championship Trophy following his team's 35-31 victory over the Alabama Crimson Tide. The Clemson Tigers celebrate their 35-31 victory over the Alabama Crimson Tide. Clemson Tigers quarterback Deshaun Watson is surrounded by confetti following his team's 35-31 victory over the Alabama Crimson Tide. Clemson Tigers tight end Grant Radakovich makes a confetti angel following his team's 35-31 victory over the Alabama Crimson Tide. Clemson Tigers quarterback Deshaun Watson and head coach Dabo Swinney embrace after their 35-31 victory over the Alabama Crimson Tide. A Clemson Tigers helmet rests on the field with confetti following the team's 35-31 victory over the Alabama Crimson Tide. Clemson Tigers head coach Dabo Swinney is congratulated by Alabama Crimson Tide head coach Nick Saban. Clemson Tigers tight end Milan Richard celebrates his team's 35-31 victory over the Alabama Crimson Tide. Clemson Tigers head coach Dabo Swinney reacts after his team's 35-31 victory over the Alabama Crimson Tide. Clemson Tigers wide receiver Carter Groomes storms the field with teammates after their 35-31 victory over the Alabama Crimson Tide. Clemson Tigers defensive lineman Christian Wilkins celebrates his team's game-winning touchdown against the Alabama Crimson Tide. Clemson Tigers wide receiver Hunter Renfrow catches a 2-yard touchdown pass against the Alabama Crimson Tide for a 35-31 lead with one second remaining in the game. Clemson Tigers wide receiver Hunter Renfrow is swarmed by teammates after catching a 2-yard touchdown pass against the Alabama Crimson Tide with one second remaining in the game. Alabama Crimson Tide quarterback Jalen Hurts scores on a 30-yard touchdown run against the Clemson Tigers for a 31-28 lead with 2:07 remaining in the game. Clemson Tigers head coach Dabo Swinney reacts during the game against the Alabama Crimson Tide. Alabama Crimson Tide quarterback Jalen Hurts rushes against the Clemson Tigers. Clemson Tigers quarterback Deshaun Watson leaps and is pushed out of bounds at the 1-yard line of the Alabama Crimson Tide. Clemson Tigers running back Wayne Gallman scores on a 1-yard touchdown run against the Alabama Crimson Tide, for a 28-24 lead with 4:38 remaining in the game. Clemson Tigers wide receiver Mike Williams catches a 4-yard touchdown reception against the Alabama Crimson Tide, closing the gap to 24-21, one minute into the fourth quarter. Clemson Tigers wide receiver Mike Williams celebrates after scoring a 4-yard touchdown reception against the Alabama Crimson Tide, closing the gap to 24-21, one minute into the fourth quarter. Clemson Tigers running back Wayne Gallman is swarmed by the Alabama Crimson Tide defense. Alabama Crimson Tide tight end O.J. Howard (88) celebrates his 68-yard touchdown reception against the Clemson Tigers with teammate, wide receiver Calvin Ridley, for a 24-14 lead, late in the third quarter. Alabama Crimson Tide offensive lineman Cam Robinson celebrates a play against the Clemson Tigers. Clemson Tigers quarterback Deshaun Watson spins in the air after a hit by Alabama Crimson Tide linebacker Reuben Foster. Clemson Tigers staff hold up signal cards. Clemson Tigers wide receiver Hunter Renfrow scores a 24-yard touchdown reception against the Alabama Crimson Tide, closing the gap to 17-14, midway through the third quarter. Clemson Tigers wide receivers Deon Cain and Hunter Renfrow celebrate Renfrow's 24-yard touchdown reception against the Alabama Crimson Tide, closing the gap to 17-14, midway through the third quarter. Clemson Tigers quarterback Deshaun Watson passes to wide receiver Hunter Renfrow against the Alabama Crimson Tide. Clemson Tigers running back C.J. Fuller gets hit by Alabama Crimson Tide linebacker Reuben Foster. Alabama Crimson Tide running back Bo Scarbrough rushes against the Clemson Tigers. Alabama Crimson Tide quarterback Jalen Hurts reacts after a play against the Clemson Tigers. Clemson Tigers wide receiver Hunter Renfrow runs after a catch against the Alabama Crimson Tide. Clemson Tigers wide receiver Deon Cain catches a pass against Alabama Crimson Tide defensive back Anthony Averett. Clemson Tigers quarterback Deshaun Watson looks down the field after being knocked to the ground by the Alabama Crimson Tide. Clemson Tigers running back Wayne Gallman rushes against Alabama Crimson Tide linebacker Rashaan Evans. Clemson Tigers quarterback Deshaun Watson passes against the Alabama Crimson Tide. Alabama Crimson Tide wide receiver ArDarius Stewart runs after a catch against the Clemson Tigers. Alabama Crimson Tide quarterback Jalen Hurts scrambles against the Clemson Tigers. Clemson Tigers quarterback Deshaun Watson rushes for an 8-yard touchdown against the Alabama Crimson Tide, closing the gap to 14-7, with 6:09 remaining in the first half. Clemson Tigers quarterback Deshaun Watson celebrates his 8-yard touchdown run against the Alabama Crimson Tide, closing the gap to 14-7, with 6:09 remaining in the first half. Clemson Tigers quarterback Deshaun Watson celebrates his 8-yard touchdown run against the Alabama Crimson Tide with teammate, defensive lineman Christian Wilkins. Alabama Crimson Tide running back Bo Scarbrough rushes for a 37-yard touchdown, giving the Tide a 14-0 lead against the Clemson Tigers, early in the second quarter. Alabama Crimson Tide running back Bo Scarbrough scores on a 37-yard touchdown run, giving the Tide a 14-0 lead against the Clemson Tigers, early in the second quarter. Alabama Crimson Tide quarterback Jalen Hurts gets tackled after rushing against the Clemson Tigers. Clemson Tigers running back Wayne Gallman carries the ball out of the end zone against the Alabama Crimson Tide. Alabama Crimson Tide running back Bo Scarbrough rushes for a 25-yard touchdown against the Clemson Tigers, for a 7-0 lead early in the first quarter. Alabama Crimson Tide running back Bo Scarbrough rushes for a 25-yard touchdown against Clemson Tigers defensive back Ryan Carter, for a 7-0 lead early in the first quarter. Alabama Crimson Tide running back Bo Scarbrough celebrates his 25-yard touchdown run against the Clemson Tigers with teammates, wide receiver ArDarius Stewart and tight end Hale Hentges. Alabama Crimson Tide wide receiver ArDarius Stewart gets hit by Clemson Tigers safety Tanner Muse. Clemson Tigers running back Wayne Gallman slams into Alabama Crimson Tide defensive back Ronnie Harrison. Clemson Tigers wide receiver Mike Williams gets hit by Alabama Crimson Tide defensive back Minkah Fitzpatrick. Clemson Tigers quarterback Deshaun Watson looks to pass against the Alabama Crimson Tide. Clemson Tigers defensive end Clelin Ferrell celebrates a play against the Alabama Crimson Tide. Alabama Crimson Tide quarterback Jalen Hurts passes against the Clemson Tigers. The Clemson Tigers kick off to the Alabama Crimson Tide. (Left to right) Clemson Tigers tight end Shadell Bell, linebacker Ben Boulware, quarterback Deshaun Watson and tight end Jordan Leggett take the field prior to the game against the Alabama Crimson Tide. Clemson Tigers quarterback Deshaun Watson points up to the sky during the National Anthem. Clemson Tigers head coach Dabo Swinney takes the field. Alabama Crimson Tide head coach Nick Saban takes the field with his players. The Clemson University Tiger Band performs prior to the game. Overconfidence should not have been an issue for the Tigers entering 2016, especially with the ache of last January’s title game loss to Alabama still lingering. Swinney made sure of it just the same. He insists he commissioned a national finalist banner for the indoor practice facility in honor of what the team achieved last season. His players didn’t necessarily take it that way. “Seeing that every day kind of pisses me off,” senior linebacker Ben Boulware says. “Coach Swinney did a great job putting that in our face.” Early on the Tigers indeed appeared to be locked in: The first three scheduled “accountability runs” of the spring—extra cardio workouts as punishment for being late to class or wearing the wrong gear in the weight room—featured zero participants. “I’ve never had that,” Swinney says. Clemson opened the season with Watson working with a full complement of assets that included 6’ 3”, 225-pound, 1,000-yard junior receiver Mike Williams, who fractured a vertebrae in his neck on the 11th snap of the ’15 season and missed the rest of the year. The defense replaced seven starters but continued to showcase the program’s ability to recruit and develop talent well enough to avoid a drop-off. New starter Kendall Joseph, an inside linebacker, finished as the team’s second-leading tackler after making 11 tackles the previous year. And there was 18-year-old, 340-pound freshman defensive tackle Dexter Lawrence, the nation’s No. 3 overall recruit, who went on to become ACC defensive rookie of the year. The Tigers won nine straight to start the season, a stretch that included high-wire statement victories over then No. 3 Louisville (42–36 on Oct. 1) and then No. 12 Florida State (37–34 on Oct. 29). The spotless record looked good from afar, but a closer examination revealed blemishes. A locker room accustomed to postvictory dance tunes went silent. Elliott saw uncharacteristically somber faces and eyes directed toward the floor; the Tigers’ assistant surmised that many of his players simply didn’t know how to lose. Swinney trotted out a rarely used but reliable bromide after the defeat—“Prosperity is a terrible teacher,” he said—and Clemson learned its lesson. The next week of workouts featured renewed diligence and attention to detail. “Guys couldn’t wait to get back on the practice field, couldn’t wait to get to meetings,” sophomore defensive lineman Christian Wilkins says. There remained one last peak to traverse, to validate at last all that the program had built, and was built upon. In the week before the championship game, Swinney beamed at what his program has become. “You’ve got a king-high flush and you hope they don’t have the ace,” he said. “That’s all that’s gonna beat you.” Only six years earlier Clemson’s coach wasn’t sure what hand he would be dealt. Following a 29–7 home loss to South Carolina that left his team at 6–6 to end the 2010 regular season, a defeat that dropped his career record to 19–14, Swinney walked the hallway toward his office at Memorial Stadium to find his wife, Kathleen, standing outside the door with tears in her eyes. She told her husband how sorry she was about the defeat. Then she informed him that Clemson’s athletic director, Terry Don Phillips, was waiting inside. Swinney was certain he would be fired. He felt his culture had taken root, but he knew the results weren’t there to match yet. So he took a deep breath and entered the room. The lights weren’t on. Phillips sat on a couch in the dark, in silence. After Swinney took a seat, Phillips delivered his verdict. He said he knew Swinney was disappointed. He told his coach that both of them would be subject to a great deal of criticism. “But let me tell you something,” Swinney recalls his boss saying. “I’m more confident right now that you’re the guy for this job than I was when I hired you.” With that, Phillips hugged his football coach and left. The play is called Orange Crush. Kindly put, it involves an outside receiver running a slant that might prevent opposing defensive backs from following the inside Clemson receiver on his out route. The Tigers’ coaching staff had been waiting to use the play until the right time this postseason, and that particular moment came with six seconds left on Monday. Trailing 31–28, and camped at the two-yard line after driving 66 yards on eight plays, they guessed there was time for one quick-hit pass attempt at a go-ahead score. Clemson had clawed back from two double-digit deficits against the nation’s most stifling defense. No sense in settling now. “We’re here to win it,” Jeff Scott said.